Utilising the power of the LiON! Nice idea - little chunky? Fed up of your battery fading on your Apple iPhone at the worst possible time? Well the new iPow External Battery Case could be you. The iPow brings not only a leather cover for your traditional iPhone (nothing for 3G newbies yet), but also includes a battery which the makers claim can double your phone's life. "iPhone batteries are not easy or economical to replace. 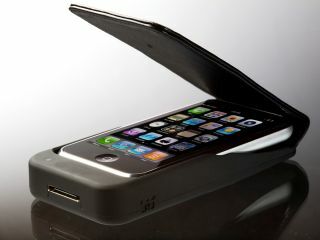 Other power solutions have come and gone but the iPow External Battery Case is the first neat and integrated solution." The nitty gritty is that the cas has its own lithium ion battery which apparently adds several hours to any activity you wish to pursue with your Apple handset. The slightly chunky case closes with a magnetic clasp, weighs in at 98g and it's yours for £49.99 from high street stores.